Chairman of Icahn Enterprises Carl Icahn participates in a panel discussion in 2015. Donald Trump hadn't yet taken his oath as president when, last Dec. 21, he named Carl Icahn as "special adviser to the president on regulatory reform." He said Icahn would help him deal with "the strangling regulations that our country is faced with." Icahn is an investor who made his first fortune as a "corporate raider," gaining control of companies through hostile takeovers and then selling assets. He ranks No. 26 on the Forbes 400 list of wealthiest Americans, with $15.7 billion. (Forbes says Trump is worth $3.5 billion.). Here are some things to know about the billionaire and his White House appointment. Trump didn't have the power to make an official appointment when he was president-elect, and he didn't take that step once he was in the Oval Office. The White House told NPR Icahn is "simply a private citizen" — not an administration official or a policymaker. 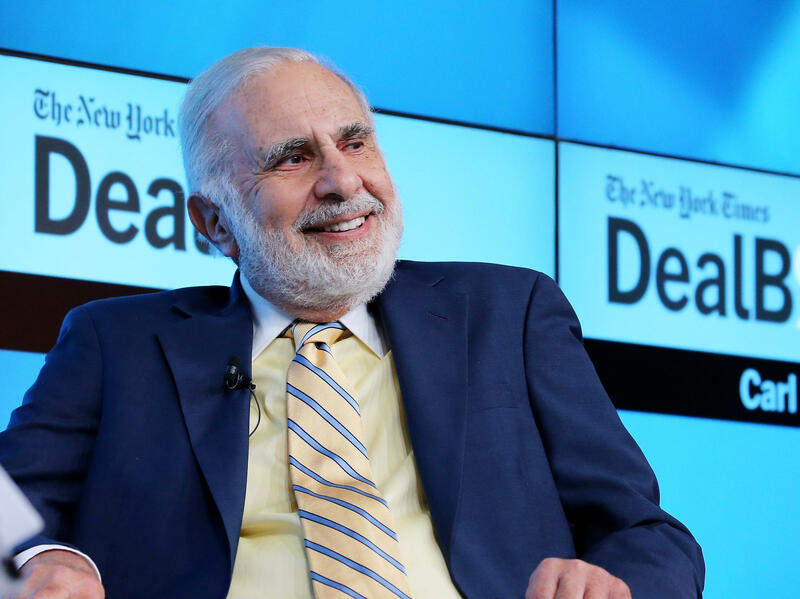 This unofficial job has a big fringe benefit: Icahn is exempt from federal ethics laws. Icahn vetted two Cabinet nominees, Environmental Protection Agency Administrator Scott Pruitt and Securities and Exchange Commission Chairman Jay Clayton. The EPA regulates oil refineries owned by CVR Energy, an Icahn company, and he has proposed a regulatory change that would substantially benefit CVR. He told CNN Money the EPA policy was wrongheaded: "Some people make a living studying artificial intelligence. I make it studying natural stupidity. And what the EPA is doing is just natural stupidity." He also has a large stake in Herbalife. The SEC is investigating the company for alleged violations of the Foreign Corrupt Practices Act, which bars U.S. companies from bribing officials in other countries. So while the conflict-of-interest rules don't apply to Icahn, the conflicts still exist. 3. Trump and Icahn are both from Queens, N.Y. But that's not to say they knew each other. Icahn is 10 years older, the son of a cantor, while Trump is the son of a millionaire real estate developer. Icahn majored in philosophy at Princeton, went on to medical school and then enlisted in the Army before going into finance. Much later, as an investor, Icahn was involved in deals following the bankruptcy of Trump's Taj Mahal casino in Atlantic City. He competed with Trump, then wound up buying and closing the casino in 2016. Icahn endorsed Trump for president in 2015. In a video, he said of Trump, "I disagree with him on certain issues and certainly would talk to him more. But this is what this country needs. Somebody to wake it up." Icahn also proclaimed a $150 million commitment to a new pro-Trump superPAC, but the group never materialized. Several Senate Democrats are calling on EPA, the SEC and the Commodity Futures Trading Commission to investigate Icahn for alleged insider trading and market manipulation. Sen. Elizabeth Warren, D-Mass., said, "When Carl Icahn is influencing policy that will affect companies, and then he is investing in those companies, buying and selling in those companies, that creates a conflict of interest that just, is just beyond what we are talking about everywhere else." Robert Weissman, president of the watchdog group Public Citizen, said, "It's not that he's on the outside buying influence. He's on the inside." Asked if anyone else in recent American history has had this combination of access to the president, a sweeping portfolio and freedom from ethics laws, Weissman said, "It is just extraordinary. And no, I cannot think of anything like it."